All Around Moving Services Company is a top New York commercial moving company that arranges services for small or large office moving & relocations companies. Providing commercial moving services in the 5 Boroughs of New York: Brooklyn, Bronx, Queens, Manhattan & Staten Island. If your commercial move includes cubicles, desks and cabinets and also have other valuable furnishings, you need professional downtown New York commercial movers. All Around Moving Company is fully bonded and licensed by the U.S. Department of Transportation, a member of the Better Business Bureau and the Chamber of Commerce. It is also one of the City of New York Mayor’s Office of Film, Theatre and Broadcasting official moving service company. All Around Moving can meet all your commercial moving needs. 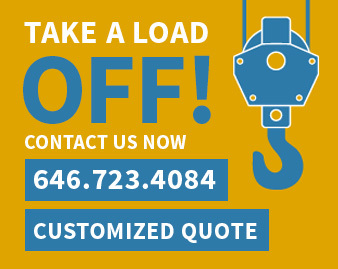 Please fill out commercial move quote form or call us at 212.781.4118. After the meeting and once the onsite estimator physically surveyed the job site, a commercial move plan will be presented and discussed, as well as any problems you envision. Moves originated in New York 5 Boroughs (Manhattan, Brooklyn, Queens, Bronx & Staten Island), are constructed with experience and very carefully. All Around Moving will arrange to construct customized an operational schedule for your commercial move. The move proposal will be detailing commercial moving costs, timing, suggest any specialist services that may be required (such cubicles and desks dismantling, carpenter for wood crating, etc.) and other associated fees. Let us assemble the best skilled and professional local commercial movers in New York City. Commercial moving services are offered in Manhattan, Brooklyn, Queens, Bronx and Staten Island. Call 212.781.4118 to speak to a representative.